Father Francis X. Prefontaine’s versatile building opened in 1891 but was gone fewer than 20 years later, a victim of the 1909 regrade. AS PORTRAITS OF classes, or of entire student bodies, became increasingly commonplace in the 1880s, a variation arose that required more work in the darkroom. Some professionals offered a montage presentation in which the group portrait included, most often in a corner of the photograph, or at other times stretched across the sky, a portrait of the school as well. Our corner “Then” example was photographed by one of the best photographers to have worked in Seattle, Anders Beer Wilse. The 19-year-old Norwegian immigrated to the United States in 1884, first working with the United States Geological Survey, much of the work in the mountains of the Northwest. In 1897, the first year of the Klondike Gold Rush, Wilse did not ship north but instead opened his studio in Seattle. He was soon garnering prestigious jobs, such as photographing the construction of Seattle’s community water system that delivered fresh water to the city from the Cedar River. For this week’s feature, Wilse’s Seattle contacts took him to Rev. F.X. Prefontaine’s St. Francis Hall. For the group shot, the photographer stood on the unpaved Spring Street a half-block west of Sixth Avenue. Dividing the students generally by gender might be by Wilse’s or the teacher’s direction, or by the students’ own proclivity for herding. 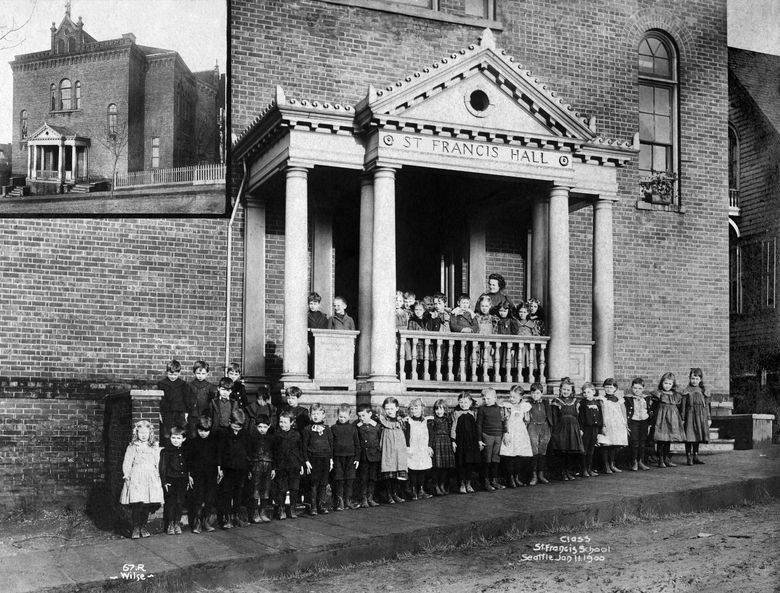 The portrait is inscribed, “class St. Francis School Seattle, Jan. 11, 1900.” The adult on the porch might be Elsie, whom the 1901 Polk City Directory names as the school’s teacher. Francis Prefontaine was Seattle’s first Roman Catholic priest. With aid of parishioners and protestants, in 1870 he built Our Lady of Good Help, the city’s first Catholic Church. (In 2017, we featured Our Lady twice in Pacific NW magazine, on March 12 and March 19.) 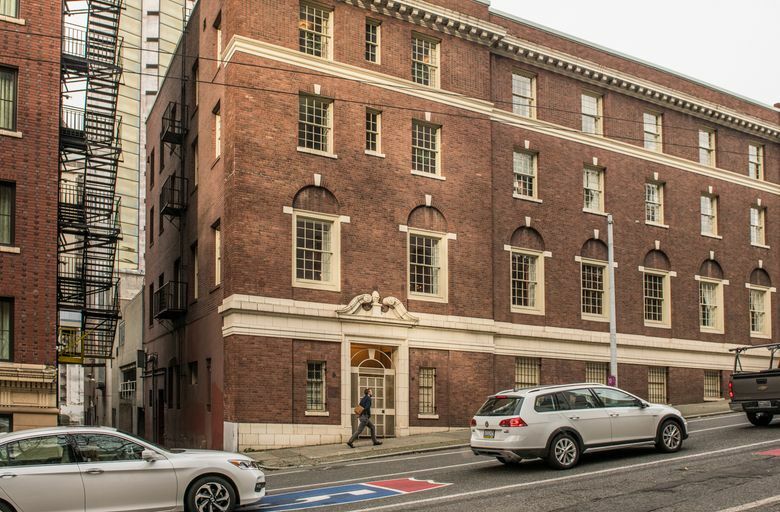 The gregarious priest built St. Francis Hall in 1890-91 and named it for the Italian saint known for his loving sermons to “all creatures great and small.” The fact the original Seattle priest’s first name also was Francis might be considered a cheerful coincidence. Other groups who rented the hall from the priest were the Knights of Columbus, Professor Ourat (from Florence) with his dancing academy, dance parties sponsored by the Adante Non Troppo Club and — late in the hall’s life, the Woodmen of the World fraternity, which arranged to attach its name to the brick landmark. St. Francis Hall did not survive the 20-foot cuts that came with the 1909 Spring Street Regrade.